to the Alabama team before the game starts. Alabama’s first appearance in the Rose Bowl in 1926 was not just a landmark event for Crimson Tide football, it was "the Game that changed the South." Until that time the recognized powers of the gridiron dwelt on either coast and in the hoary Midwest. It was up to this upstart team from Tuscaloosa to change that perception but it wasn't going to be easy. 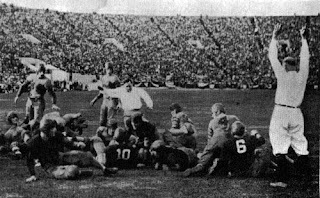 By the 1920s, the Tournament of Roses inter-sectional matchup of the best football team from both sides of the country had become the de facto national championship game. The popularity of Pasadena, California’s premier event had prompted the organizers to construct the largest stadium in the country in 1922 – the Rose Bowl. As Alabama wrapped up a dominant 1925 season there was little consideration the Crimson Tide would be playing one more game on New Year’s Day. Southern teams simply weren't invited to the Tournament of Roses invitational - even teams as dominant as Alabama. Under head coach Wallace Wade, the Crimson Tide had become a gridiron juggernaut. In his first two seasons in Tuscaloosa the Crimson Tide had outscored opponents 516 to 74 and rang up a dozen shutouts. 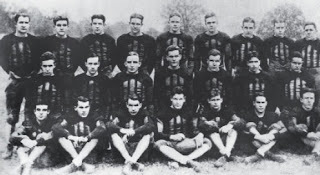 The 1925 season was no different, with the Crimson Tide running up a 9-0 record and only allowing a single touchdown the whole season. 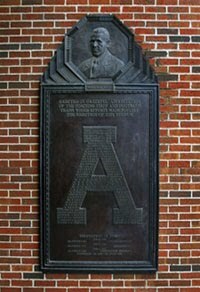 It helped that his squad boasted two of the greatest talents in southern football at the time; All-American Allison "Pooley" Hubert and Johnny Mack Brown, also known as "the Dothan Antelope." Up in the Pacific Northwest, the University of Washington football team was on a roll as well. In five years under head coach Enoch Bagshaw the Huskies had amassed a 37-6-5 record. The success was partially due to the presence of All-American George "Wildcat" Wilson. On offense Wilson played halfback and was a master of the stiff-arm tactic to gain more yardage. Able to to run, pass and kick with equal skill it was impossible to predict what he might do with the ball in his hands. As a linebacker he anchored the Husky's stout defense. 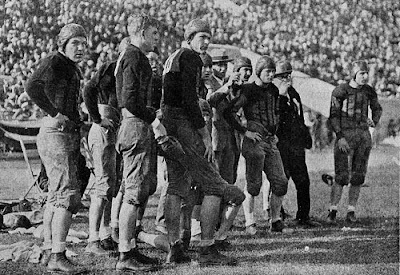 The Husky’s 10-0-1 record in 1925 earned them the Pacific Coast Conference crown and an invitation to play in the 1926 Rose Bowl. But just who would be their opponent wasn’t clear at first. 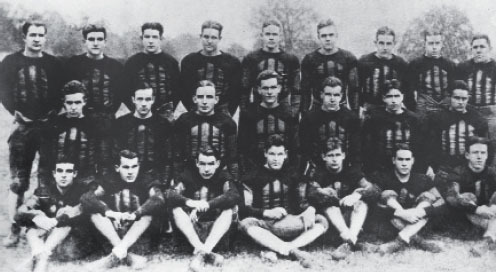 Dartmouth had finished the 1925 season 8-0 and was considered the eastern champion but turned down the invite to play. Offers to Princeton and then Colgate were also extended and rejected. Finally, the Tournament of Roses committee turned to the recognized southern champion and offered an invitation to Alabama. Wade and his players accepted. The general consensus was that Alabama was going to get whupped. No less than coaching legend Glen "Pop" Warner said Washington was just too big for the smaller Crimson Tide squad to handle. Entertainer Will Rogers summed up the general sentiment when he called the Alabama the "Tusca-losers." Washington’s players took a lot of such talk to heart, treating their game preparation as light workouts. Wade, on the other hand, promised his team three weeks of "tough hard practice" and kept his word. The stops on the 2,000-mile train ride were punctuated with wind sprints and practices. Moreover, when the team arrived in Southern California Wade kept the player’s sightseeing jaunts to an absolute minimum. 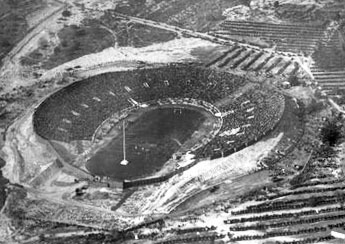 So on Jan. 1, 1926 an estimated 45,000 spectators were on hand for the 12th Rose Bowl game in the distinctive horseshoe shaped stadium located in the Arroyo Seco section of Pasadena. In Alabama, theaters were set up with a special news wire so audiences could follow the play-by-play. Washington’s Wilson didn't waste much time before making his presence felt. In the first quarter he singlehandedly stopped an Alabama drive that reached the Washington 15-yard line with a tackle for a loss, a sack and an interception back to midfield.The powerful halfback picked up most of the remaining yardage in the drive until the last play, when Harold Patton took it in from the one for the score. George Guttormsen's drop-kick for the extra point was no good. The Huskies were on the scoreboard 6-0. Alabama's offense found itself stymied by the Wilson-led Husky defense on every possession. Hubert got so upset with his teammate's performance he called them over during a timeout and yelled, "All right, what the hell’s going on here?" In the second quarter Wilson struck again ripping off a 36-yard-run to the Alabama 20. Then, on the very next play, he tossed a touchdown strike to Johnny Cole. Guttormsen missed the extra point once again. Washington was up 12-0. Right before halftime, Wilson was hit hard by three Alabama players and fell to the ground unconscious. He was carried off the field and the second quarter finally expired. The Alabama players were expecting a halftime speech from their coach that would sear the paint off the walls. Instead Wade walked into the locker room and, in a low voice, simply said: "They told me boys from the south would fight." As Alabama returned to the field for the third quarter, Wade made a few key adjustments; moving heavier players to the end and allowing Hubert to run more. In addition, Washington's star player was still out of the game allowing Hubert and Brown a unique opportunity to go to work. On the Crimson Tide's first possession in the second half Hubert immediately ripped off 26-yard dash to the Alabama 12-yard-line. Hubert carried the ball on the next four plays, the last a one-yard plunge into the end zone. Bill Buckler made the extra point and the score was 12-7. Alabama’s defense forced Washington to punt on the next possession and the Crimson Tide offense went to work again. Crimson Tide back Red Barns ripped off a pair of runs to the Alabama 39-yard line. Washington got set for the run, bringing seven men to the line, and Grant Gillis took the ball and threw a long pass to Brown at the Washington 25. Brown sidestepped the only Husky defender between him and the goal line and scored. Buckler made the extra point and Alabama grabbed the lead, 14-12. Pooley Hubert scores for Alabama. The Crimson Tide got another break on the next possession when Washington fumbled the ball over at their own 30-yard-line. Hubert immediately threw a pass to Brown who caught it at the three-yard-line and powered it in. "I took it in stride," he said. "I used my stiff arm on one man and went over carrying somebody." Buckler missed the kick after and the score was 20-12 in favor of the Crimson Tide. In the span of less than seven minutes, Alabama had managed to score three times and held Washington to less than 17 yards of offense. Alabama was on another drive in the fourth quarter when Wilson came back in the game and the Huskies mustered the will to stop the Crimson Tide on fourth and one at the 12-yard-line. Wilson then led his team the other direction. A 27-yard pass from the All-American to John Cole shaved Alabama's lead to a single point. The Washington kicker completed the point after but the Crimson Tide was still ahead 20-19. The Crimson Tide secondary then stepped up to seal the game. On Washington’s next possession, Gillis intercepted a Wilson pass and Herschel Caldwell ended the Husky’s last possession in the same manner. Alabama prevailed 20-19. Washington's Wilson finished the game with 134 yards in 15 carries, five completions for 77 yards and three touchdowns. He accounted for 211 of Washington’s 317 total yards and Alabama was unable to reach the end zone while he was on the field. Yet, for the 22 minutes he was on the sideline the Huskies could only manage 17 yards and the Crimson Tide scored three unanswered touchdowns. The difference in the contest was Alabama kicker Buckler whose two of three extra point conversions provided the margin of victory. The victory gave Alabama its first National Championship and raised the estimation of Southern football immensely. The Crimson Tide had "won the Rose Bowl for the whole South," Brown declared and the whole south turned out to celebrate. The newspaper reports of the game had electrified the country and they showed up to celebrate their heroes. At every stop on the way back to Tuscaloosa the Alabama train was met with jubilant crowds, marching bands and the inevitable speeches by local panjandrums. 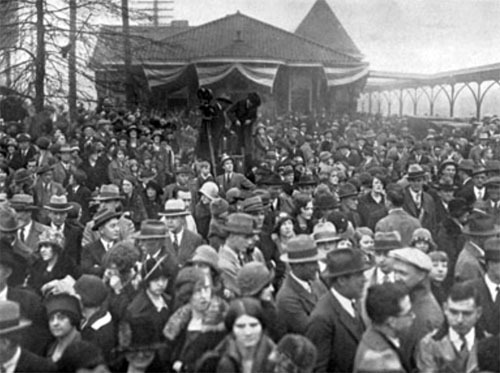 The Tuscaloosa train depot was inundated with well wishers as the train pulled in with eager fans climbing on the building’s roof for a better look at the players. It took an hour for the team caravan to progress from the depot to downtown – a distance of less than a mile. Alabama football had finally arrived. A version of this story first appeared on Roll Bama Roll.